My name is Laura Connell. I was born and raised in Valdosta, GA (GO Cats!). I now reside in Adel with my husband Daniel , and our 2 precious daughters (Karsyn and Lenton Claire). My family and I are members of First Baptist Church. After graduating from Valdosta State University in 2008, I began my teaching career teaching 1st grade at Sallas Mahone Elementary in Valdosta. I taught there for 6 years before coming to Adel. 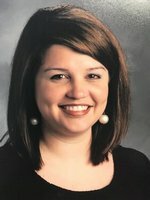 I currently teach 3rd grade reading and social studies at CES. I love working in Cook County and especially at CES!